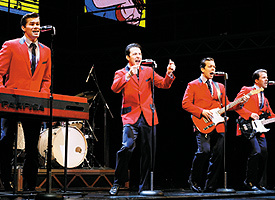 Tony Award-winning Jersey Boys, opening at the Orpheum, chronicles the career of Frankie Valli and the Four Seasons. A tune like “Big Girls Don’t Cry” vibrates to Valli’s visceral signature falsetto of the early ’60s in contrast to a smoother ’70s sound with “December 1963.” It means the actor playing him must master that range and the play itself. What’s more, each Jersey Boys company needs four men to play Frankie: one, six times a week; another, twice weekly; and two understudies. Frankie Camp addresses this, and gives young auditioners—mostly in their 20s—a more relaxed workshop type of experience than your typical casting process. As dance expert, Gregus knows the strong suits of contenders are apt to be singing and acting, not dancing. So, he spends more than eight hours helping them to expand physical consciousness, teaching them bits of choreography that reflect Jersey Boys’s range of time periods from the late ’50s to circa 1990. Frankie Campers are guided vocally by Katie Agresta. Though trained in classical voice with the late Edward Dwyer, she has coached rock legends Cyndi Lauper, Annie Lennox, and Bon Jovi. It’s also what the actor playing Valli must be able to do.